Paper crafting products for card making and scrapbooking. 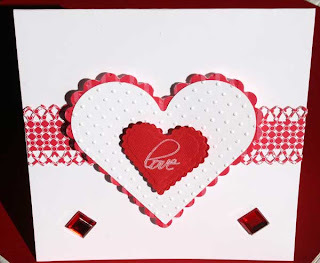 I am trying to finish up my Valentines Cards for my Great Grandchildren. I have one now for each adult and one for the kids in each family. I was hoping to get 11 made for them, but they are going to have to share this year. I love my new Martha Stewart's diamond punch. I think it adds a lot to the interest of the card. If you need to know any details on how I did this card (or any of the cards) please e-mail me. Beautiful card! Your family will really enjoy receiving a card from you! The Martha Stewart punch does look nice - I'm going to have to look for it. We don't have a Michaels close by, but maybe Walmart might have it?! Oh very pretty. I love that punch and it really adds dimension. **Due to new 31 Bypass - Take Exit 233 West (Walkerton/Bremen) U.S. 6 to light. Turn North (right) onto Michigan Rd. (formerly US 31). I am one mile north of this intersection on the left side. OR take Exit 245 (Kern Rd) - turn south on Michigan Rd. (formerly US 31) and go 11 miles - the shop is on west side of road. **I don't currently have set shop hours. to make sure I will be available. Thank You. If you want to place an order, please e-mail or call 574-784-9050 with a list of items you wish to order. Shipping Charges, including International orders are exactly what it costs me to ship to you. If there are any products you can't find or would like for me to order for you, please e-mail or call 574-784-9050. All manufacturers are listed on the right hand side under "Items In My Store". When you get to the bottom of the page, click on "Previous" and that takes you back to previous pages. If you need help, please don't hesitate to contact me. Also, when placing your order, please put ORDER in your subject line. If you do not get a Thank You back, please contact us again as your order went to spam. We try to catch them all, but sometimes the orders get missed because I can have 50+ pages several times a day. It really helps if ORDER is in the subject line.